One of many reasons I love art is so that I can celebrate the people and events in their lives that are meaningful to me. One of my dearest friends had her first baby at age 42! And this is their precious little girl around 6 months old. I had knitted the little bolero/sweater for her and they took her picture in this oh-so-grown-up pose. I could not resist capturing it in charcoal. 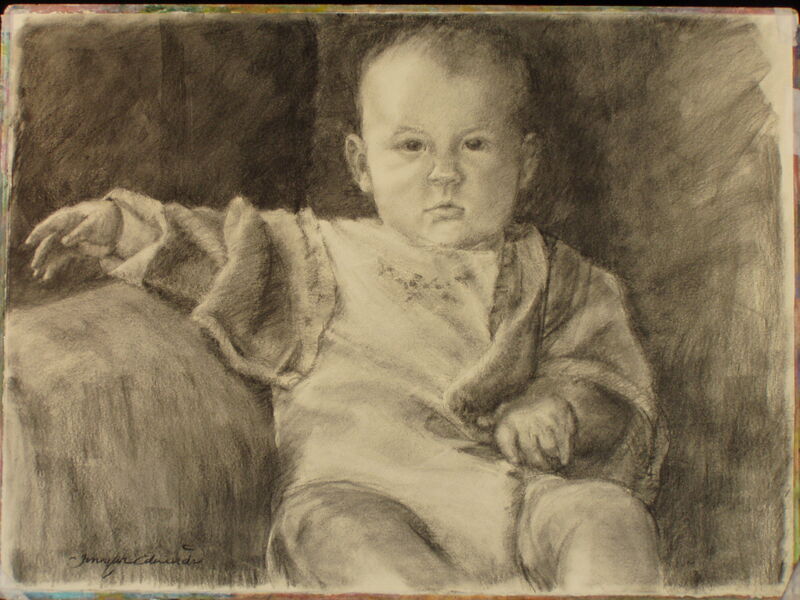 A baby is quite a challenge to draw…their proportions are so different from older children and adults. I was not only mesmerized by her face, but also by the hand draped over the side of the chair or sofa. I learned a ton from attempting this portrait and I also felt like I got to know something of her personality at this fleeting stage of her young life.